With the Rio Olympics going on the world in watching and there is one question on their minds: How are the Brits doing it? 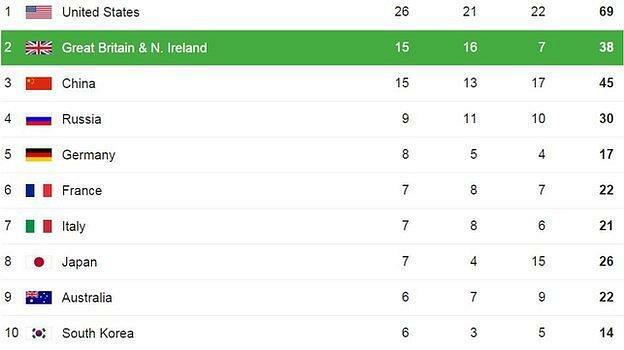 This is due to Britain being 2nd in the medal table (at time of writing) and with 3 days left it looks like a set place. Now some say that 2nd place is 1st loser but considering Great Britain and Northern Ireland have exceeded their predicted target and looking to end up higher than they were 4 years ago on home turf I think that’s a pretty impressive achievement. And not to sound bitter but over 50% of the USA’s medals are from swimming, so for 2020 we just need to hope Katie Ledecky & Michael Phelps retire and we’ll be set. Now there are many reasons that can be attributed to Team GB’s success, and I’m sure they’ll thoroughly be reviewed post-Rio, but what no one can deny is the significant rise in Team GB in the medal tables of the past Olympics. 10th at Sydney 2000 & Athens 2004, 4th at Beijing 2008, 3rd at London 2012 and now predicted to be 2nd at Rio 2016; that is some rapid progression that has put Team GB in a place that it can face off against the three super powers of the world. One thing I truly find amazing about the Olympics is its power to inspire. I am a competitive fencer myself and I was astounded to see how many people took up fencing after London 2012. I also couldn’t hide my excitement to see Richard Kruse fight for GB’s first fencing medal in 52 years on BBC 1, despite him not winning it I loved the media coverage my rather unconventional sport was receiving. The Olympics are an inspiring sceptical that has the potential to have such a positive impact. This of course does put into perspective your own life, and I don’t necessarily mean how slow Usain Bolt makes you feel. More in regards to how successful you as an individual have been as well as your company/industry has been in regards to progression and innovation. The CiPD found that a third of employees are disappointed with their career progression and it always seems that the Big Change is just around the corner but never comes. This could be attributed to so many things; loss of focus on making change happen, being happy with the small amount of progress that has occurred or worse, thinking that the change is impossible. Continuous development is key in an industry like HR but it can sometimes can be difficult to identify if any traction is being made as there is never a completed job as may have been the past. What would be needed to be done is to set some flags in the sand and establish what progression is, definitions and goals are required in order to both aspire and to monitor achievement. After Athens 2004’s 10th result and finding out that London would host by 2005 Team GB then had a goal and put into drive that competitive spirit. Whether that meant funding, getting the right equipment or bringing in renowned coaches. To make a parallel comparison the HR industry wants to figure out where it wants to be in 5 years and get the technology, people and process in place to achieve that. If people got on board with an effective plan, have the resources to support them and believed in the goal then HR would be standing on the top of the podium of the business world in no time. I don’t want to revisit too many people’s high school experiences of not being popular, but there is a thought in organisations of whether the employees actually care. When a CEO talks about the values of their company they often will say in interview that Company X really does care and will be passionate about achieving our goals for our customers, or something along the lines of that. But I ask, how do you know? If anything I want to invite a bit of insecurity into the minds of the leaders of organisations. First thing to do is to check whether the values are something you stand for, or have they just been picked out of a hat for convenience? This can avoid over general values that don’t distinguish themselves from any other company; an example could be something related to customer satisfaction which is really something every company should have as a value and there needs to be more elaboration about how Company X actually produces this value. It’s not an easy task to establish these values and make sure they are a representation of what your company believes in but if the effort isn’t put in anything done further would be building on sand. The issue I really want to get to though is do the employees care? While their views and opinions may be reviewed in regards for the values it is really the higher ups that establish what values the organisation believes in. It’s been reported that up to 86% of employees aren’t happy in the work they do and this is put down to the fact they aren’t aligning to the values of the company. No matter what an individual’s skill or job motivation there is a role that is perfect for them, the trick is identifying it and optimising it, just because a person’s parent was a lawyer and they themselves have a law degree doesn’t mean they’re destined for the legal profession. If the individual has been passionate about the environment all their life they may take that knowledge and use it in policy research and campaigning, and I would guarantee every day’s work in that role would be such a higher quality than any day’s work they did for a law firm. There are two ways to achieve a workforce with the shared values of the organisation. The first way is to figure it out is by identifying it at the source, through the recruitment and selection that the company has in place. This can be done through a range of measures such as personality assessments and situational judgement tests an if you’re being fancy you can also benchmark it to current employees for comparison. The alternative way, and by far harder, is to establish how aligned and motivated towards a company’s current employees are. This can be difficult because it can uncover some uncomfortable truths but in order to optimise the work that’s being done everyone needs to be aboard, however this process can benefit the individual’s development to identify where they will thrive. But why should you care? Well you don’t have to but it’ll be an uphill battle to get your company running the way you’d like. If 86% of your workforce isn’t on the same lines as the leadership then everything has to be micromanaged and no trust can be given to the work force. This isn’t anybody’s fault, if you don’t believe in the values you can’t be expected to suddenly drum up some motivation, but if you can see this and don’t do anything about it then it becomes an issue. The world of business is a tricky one that comes with so many obstacles but your own team shouldn’t be one of them. For a long time, I have believed that the comfort zone is a good thing and why shouldn’t it be? It is a safe space, while you’re in there nothing can hurt you, you feel reassured and sheltered, but maybe leaving it every now and then wouldn’t be such a bad idea. Maybe the comfort we feel within that zone isn’t as beneficial as we like to make ourselves believe. By staying within the comfort zone you allow yourself to forget about trying something new and facing your fears, such as talking in front of a large crowd or when you didn’t go on that trip when you were 11 because you didn’t want to leave home for too long. The comfort zone is easily one of the major faults of human development, but also something most of us think quite highly of, even if we don’t care to admit it. It allows you to willingly limit yourself by sticking to things that make you feel comfortable. As you find more things that give you that feeling of comfort they are added to your comfort zone - however if you never leave the comfort zone how are you meant to widen it? Leaving your comfort zone is very easy on paper, but not so easy to put into action. The simplest way to start is to keep reminding yourself of the multiple benefits that you can receive when you force yourself to leave that comfort zone you love so much. Take the example of being able to talk in front of a group, be it peers, colleagues or strangers. You may have an exceptional idea you want to share and pursue, but you can’t do it on your own, you need the help of other people, for example your colleagues. The easiest way to convey your idea would be to gather them together and wow them with your idea - but you don’t because you won’t leave the comfort zone and your idea is left forgotten. If you had left your comfort zone and conquered your fears that idea may have been acted upon and you may have gained that promotion you so wanted or even just gained the satisfaction of hearing feedback on your idea. Try publicising any idea that you have somewhere where you can receive criticism and feedback that isn’t necessarily personal, such as in a blog post, this will teach you to take criticism and thicken your skin so you aren’t as sensitive to feedback, it may also help you improve your idea. Try setting yourself a significant goal that would require weeks or maybe even months to achieve, this will allow you to set and reach smaller goals in order to get to the end goal. For example, when designing a game, there are a lot of smaller goals that have to be achieved before reaching the finished product, such as finalising the concept, creating the design and coding the game. Put yourself in a new environment. Small changes such as eating with someone new at lunch, or not sitting at your usual desk allow you to interact with new people and surroundings which could open up new opportunities. Finally, you can try choosing one of your biggest fears and facing it head-on. If you are afraid of heights, challenge yourself to try skydiving or going for a hike up a mountain or even just the highest diving board, anything to test your fears is a good way of getting yourself out there. Getting ahead of the limitations that are set by the comfort zone will allow you to broaden your horizons and allow you to find future successes.